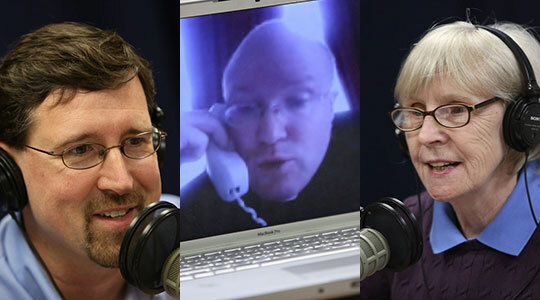 Summary of today’s show: On a special Thursday news edition of the show, Scot Landry, Susan Abbott, Fr. Roger Landry, and Gregory Tracy discuss the week’s headlines, including the Pilot special report on a Boston pilgrimage to Cuba; the retirement of three long-serving pastors; the sale of St. James in Wellesley; National Catholic Education Association convention in Boston next week; and a profile of the work of the diocesan archives. Finally, the panel took some time to discuss the importance of the Easter Triduum, especially Holy Thursday and Good Friday and the unique differences from all other liturgies. 1st segment: Scot wished Susan a blessed Triduum. He said what stands out for him today is that there isn’t a Mass today at the Pastoral Center. Susan said the Holy Thursday Mass of the Last Supper is worth waiting for. Fr. Roger said the Chrism Mass is traditionally held on Thursday morning. There can also be a Holy Thursday Mass of the Lord’s Supper for those whom it would be impossible to attend the regular evening Mass, but that requires a bishops’ permission. Scot said part of the Holy Thursday observance is to process from the Church with the Blessed Sacrament to a place of reservation to hold vigil with the Lord. Scot wanted to start with the news this week, especially the Pilot’s special coverage of Pope Benedict’s trip to Cuba. Greg said he and his wife, Donis, who wrote most of the articles, accompanied a delegation of Boston pilgrims who went to Havana to go to Mass with the Holy Father, but also visited cultural sites as well as the work of Caritas Cubana, the Church’s social service agency. Donis also wrote a story detailing Cardinal Seán’s long relationship with the Cuban people. When he was first a priest in Washington, DC, he worked closely with Cuban-Americans in serving refugees and others. Scot said the Cardinal talked a bout how conditions in Cuba changed significantly after 1998 when Pope John Paul II visited Cuba. The cardinal went to Cuba in 2003 for an apostolic visitation of the seminaries. “I found that of the 80 or so seminarians, 90 percent of them were converts who attributed their conversion to [Pope] John Paul II’s visit to Cuba,” he said. Scot noted that Raul Castro declared Good Friday to be a national holiday this year after Pope Benedict’s visit. Fr. Roger said being in the presence of Christ’s Vicar on earth is a powerful reminder that the reason for the Pope was Peter and the reason for Peter was Jesus and it’s all real. It’s a powerful reminder that the Christian story is all true and it’s not just history, but a present reality. He said it’s also curious that while Good Friday will be a civil holiday, we also heard that 42 Cubans arrested during the visit last week that they will remain in prison through the Triduum. Scot said he enjoyed the profile of the Educational Travel Alliance, which has been leading trips to Cuba for the last 10 years. He noted that the founder has personal reasons for this work. For Eizenberg, the trips are also closely linked to his personal experiences. He said the words of his mother, a survivor of a Nazi death camp, echo in his mind whenever he brings a group to Cuba. “She used to say, ‘We knew we were really in trouble when no one was coming (to Germany) anymore and we were left alone with them,’” said Eizenberg. “I don’t want that to happen to the Cuban people anymore,” he added. In the future Eizenberg is hoping to develop a campus ministry program facilitate student mission trips to Cuba. “Campus ministries go everywhere in the world to help people, but they don’t go to Cuba,” he explained. “We shouldn’t keep Cuba off the map,” he said. Greg said the more they got to know the travel organizers the more they realized that there was a story in their work and mission. Greg said his impression of Cuba is that it’s a country stuck in time. It’s essentially stuck in 1959, at the moment of revolution. “By nature, the American people are very generous,” added Eizenberg, noting that people who go on his exchanges often come laden with everything from soaps and spices to nail polish and children’s toys — items that can be found on any U.S. store shelf but can be nearly impossible to obtain for ordinary Cuban citizens. Susan said thought it was interesting how Eizenberg said he was immediately hooked on Cuba and thought he could make a little difference. She said one doesn’t have to change the world, if you can change one person’s life. Greg said his group visited a senior center and brought little fun-sized candy bars to hand out and one of the women said these were extremely valuable. She said her grandchildren might see one of these per year if they’re lucky. 2nd segment: Scot noted the news of official appointments in the Pilot this week, including the granting of senior priest/retirement status effective June 5: Fr. Richard Crowley, pastor of Sacred Heart Parish in Middleborough, Fr. Francis Daley, pastor of Sts. Martha and Mary, Lakeville, and Fr. James Rafferty, pastor of St. Paul in Hingham. Fr. Rafferty received an award as a priest of the year on Tuesday after the Chrism Mass. Susan noted her work with Fr. Crowley and how much he has done in that parish, along with the other pastors. Scot said the parish in Lakeville is in a beautiful location. Scot said Fr. Jim Rafferty took some heat a couple of years ago for a decision he made about admission of child of a lesbian couple. Fr. Roger wrote an editorial at the time about how Fr. Rafferty took heat for this decision, which he believes was appropriate given that the child would have been taught at school that her situation at home was immoral. Fr. Roger said Fr. Rafferty was really looking out for the best interests of that child. Fr. Roger noted that Fr. Rafferty is looked up to by all priests, young and old, and has set a good example of being a pastor. Scot said he was impressed by the way Fr. Rafferty handled that situation. Also in the Pilot is Vatican approval of the sale of the former parish church of St. James to the town of Wellesley where they will build an athletic center. Scot noted that the parish had been in vigil for several years and he hopes that this will bring closure and help the town of Wellesley. There is a special insert in the Pilot this week for the National Catholic Education Association, which will hold its national conference in Boston next week. Susan said it’s a very large event over three days. It attracts national speakers and lots of attention. She said it’s convenient for the conference to come to Boston because they don’t get to travel for conventions lately. Scot said the Inner City Scholarship Fund had it’s annual dinner to raise $3.7 million for Catholic school scholarships. Greg said they always want to do a story to acknowledge the work that they do. One of the students who receive help spoke at the dinner. In making the announcement Mr. Reynolds and Mr. Tucci also recognized Fortune Kalala, a senior at Central Catholic High School in Lawrence, who was the evening’s student speaker. Fortune, a scholarship recipient and honor roll student, moved to Lawrence when he was 13 from Mozambique where he had lived in a refugee camp with his family. After years of fleeing political unrest and civil war, Fortune began the 7th grade not knowing any English. After two years of hard work, he was accepted to Central Catholic High School and was able to attend because of a scholarship provided by the Inner City Scholarship Fund. In the Anchor this week is a profile of the Archives of the Diocese of Fall River. Fr. Roger said it’s part of a continuing series on diocesan agencies. He said the Archives keep the history of the diocese. Those records are very important for future Catholics to understand what happened in the past. Susan said Robert Johnson Lally, the archivist in Boston, has been extremely helpful for her when she researches her own topics. She finds the material to be gripping and amusing. Scot said he went through the archives once to read all the files used to plan the visit of Pope John Paul II to Boston in 1979. He wins the CD “The Truth” by Fr. Larry Richards and “The Stations of the Cross in Masterpiece Art,” a set of 6”x9” prints. In the Gospel readings of the Easter Octave, the Church annually remembers the utterly unprecedented nature of the paschal event, and how it exploded expectations of what God’s decisive action in history would be. No one gets it, at first; for what has happened bursts the previous limits of human understanding. The women at the empty tomb don’t understand, and neither do Peter and John. The disciples on the road to Emmaus do not understand until they encounter the Risen One in the Eucharist, the great gift of paschal life, offered by the new Temple, the divine Presence, himself. At one encounter with the Risen Lord, the Eleven think they’re seeing a ghost; later, up along the Sea of Galilee, it takes awhile for Peter and John to recognize that “It is the Lord!” (John 21:7). These serial episodes of incomprehension, carefully recorded by the early Church, testify to the shattering character of Easter, which changed everything: the first disciples’ understanding of history, of life-beyond-death, of worship and its relationship to time (thus Sunday, the day of Easter, becomes the Sabbath of the New Covenant). Easter also changed the first disciples’ understanding of themselves and their responsibilities. They were the privileged ones who must keep alive the memory of Easter: in their preaching, in their baptizing and breaking of bread, and ultimately in the new Scriptures they wrote. They were the ones who must take the Gospel of the Risen One to “all nations,” in the sure knowledge that he would be with them always (Matthew 28:19-20). They were to “be transformed” (Romans 12:2). So are we. Fr. Roger’s editorial this week examines the heart of Holy Week, which the Heart of the Christian faith and life itself. The heart is who Jesus is and what he’s trying to do. Pope Benedict notes that the people around Jesus at first acclaimed an idol of their own imagination rather the Jesus as the real Messiah and King. Jesus came to give witness to the truth. Jesus is the axis of truth on which everything depends. In being crucified, Christ becomes the power and wisdom of God. We need to recognize Jesus as the truth and not separate him from the truth that he taught. In our relativistic age, people reject the idea of truth. Scot noted that this Holy Thursday is a much bigger deal than Opening Day for the baseball season. Susan said these three days are the jewel in the crown of our liturgical year. We celebrate and remember the ongoing Eucharist in our lives. These aren’t holy days of obligation, but Susan said her church is packed at every service because how much richer Easter is when we’ve walked the walk with Jesus. Scot said some will ask why they’re not holy days of obligation. Fr. Roger said the Church would never dream of making something so significant mandatory. A practicing Christian would never be forced to go; they’re going to want to be there. That’s how it’s supposed to be for us as Christians. To call it an obligation would be to downgrade it. Scot noted that the Holy Thursday Mass has two significant differences: the washing of the feet of 12 men and that the Mass has no actual dismissal, but continues to a place of adoration. Greg noted that the connection to the Passover seder and how the least important person, usually the youngest child, would wash to hands of all those present. Jesus takes this last place and then goes further to wash feet, which in the Middle East feet are considered lowly and unclean. Fr. Roger noted that the Book of Revelations says were are cleansed in the blood of the Lamb, and Jesus takes on the form of a slave to wash us in his own Blood. Then he gives us the chalice of his Blood, where he continues his love to the extreme. He institutes the priesthood to continue to feed us and wash us across time and space. Like a parent for a small child, Jesus washes us and feeds us. Scot noted that on Good Friday, it isn’t a Mass, we hear the Passion from the Gospel of John, and we have the veneration of the Cross. We also pray profound prayers of petition for the world. Susan said we are a Church of sign and symbol and much of what we do doesn’t have words. We hear the Passion of the Lord and we kiss the cross, and it’s a powerful action. Scot said there will not be an episode of The Good Catholic Life on Good Friday and wished all listeners a Happy Easter.